Price includes: one color / one position imprint. Want a nice gift for an event or business party? Wine chiller will fit the bill. 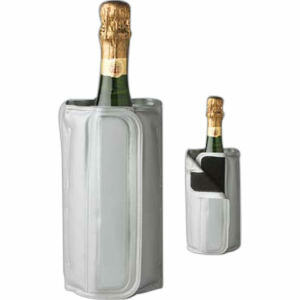 Bottle Cool is a deluxe wine and champagne chiller sleeve that can be imprinted. Store in freezer, adjusts tightly around the bottle with hook tape closure to keep bottles cool longer. Stands 7-3/4″ high 15″ wide when laid flat. Min 60-99 pieces, 8.58 ea. 100-499 8.50 ea, 500-999 7.78 ea, 1000-2499 7.67 ea, 2500 + 7.00 ea. Set up is 50.00. Imprint: 2-1/2″ x 3/4″.